Let me introduce you to my good friends Molly and Socks Henderson. 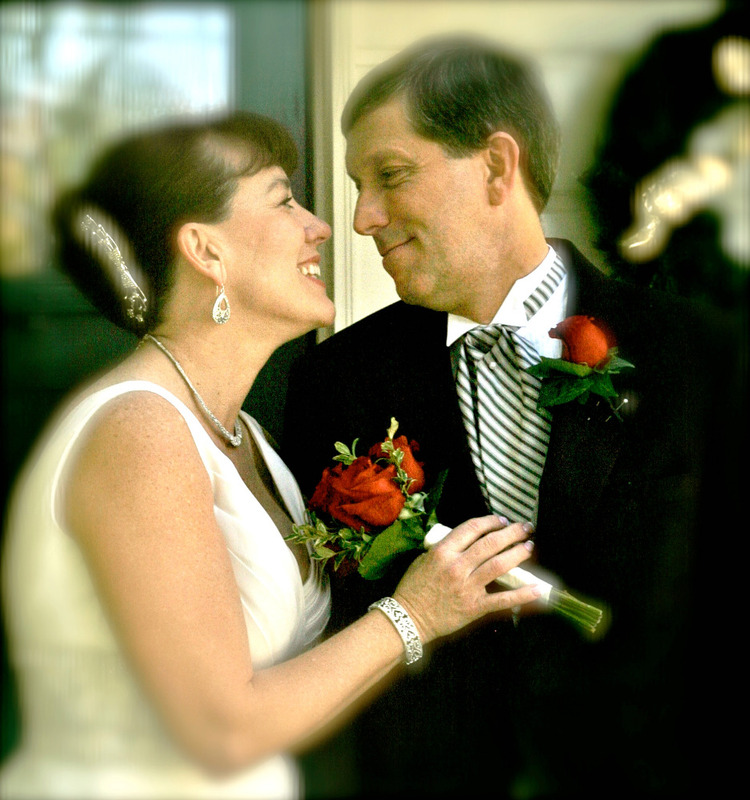 Their story is an incredible journey and testament to the power of love, faith in God, and courage. It has been a test of what we think is important in life vs what REALLY is. 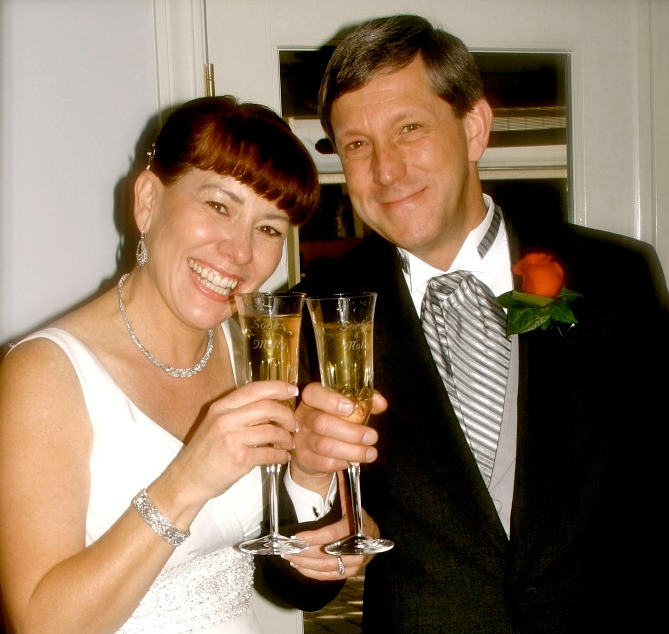 They met on eHarmony in 2009, after waiting their entire lives to find one another. 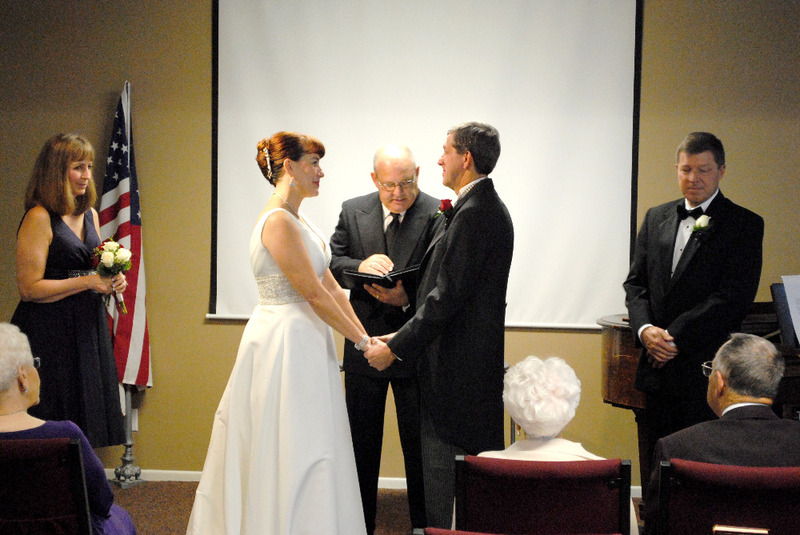 They were married in December of 2010. 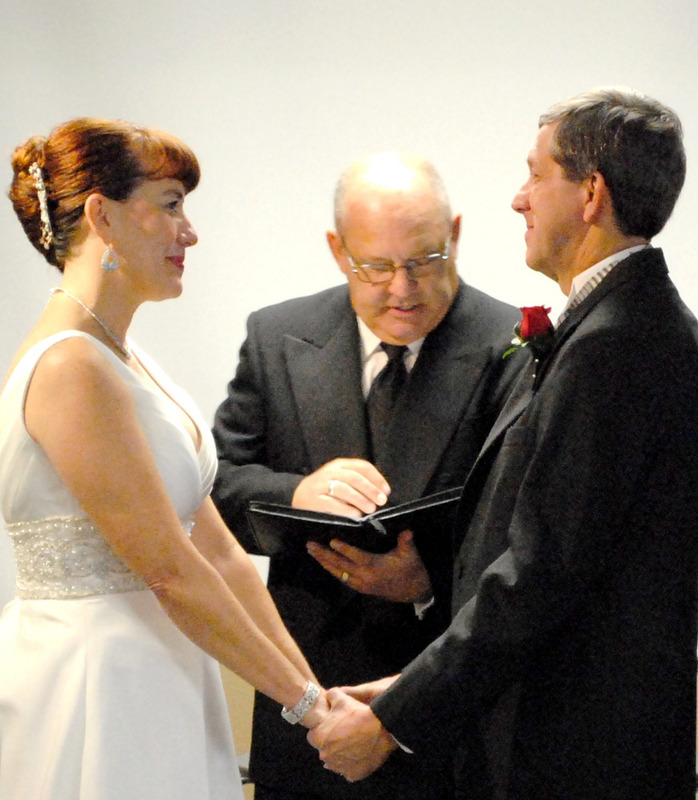 When they said their wedding vows, to love one another in sickness and in health, they had no idea the road they would begin to travel just 20 months later. 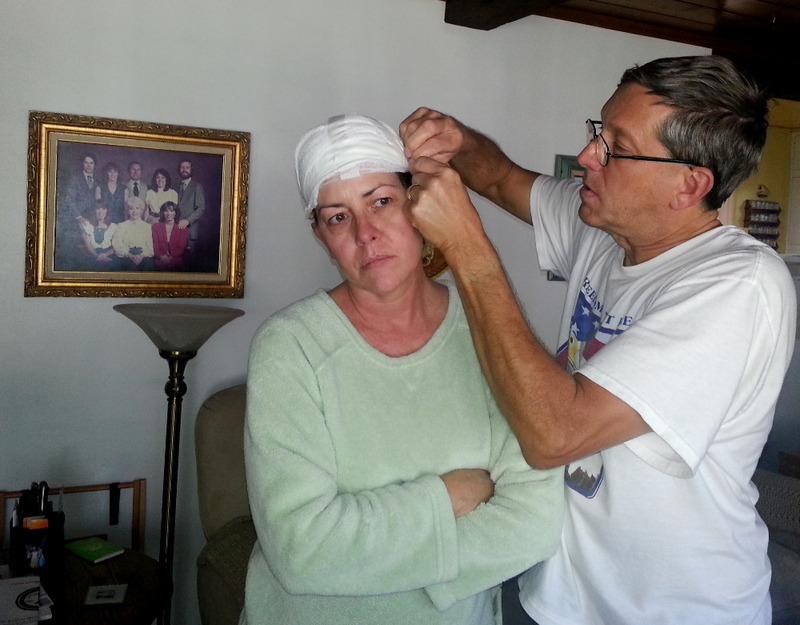 A seemingly harmless headache soon became debilitating. 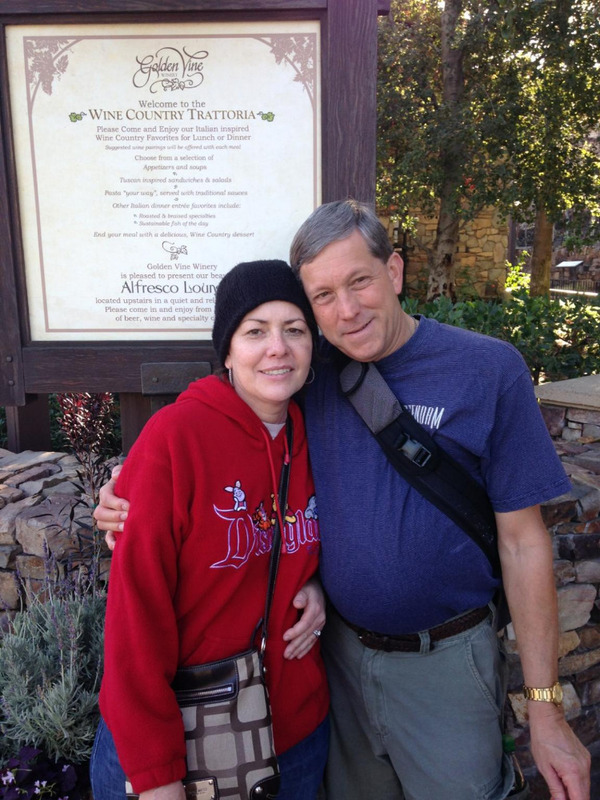 It would eventually be diagnosed as Glioblastoma Multiforme Stage IV, the most aggressive form of brain cancer. Her doctors gave Molly 18 months. But God is in charge! Two years since receiving this devastating news, Molly is still fighting and their lives have changed dramatically. 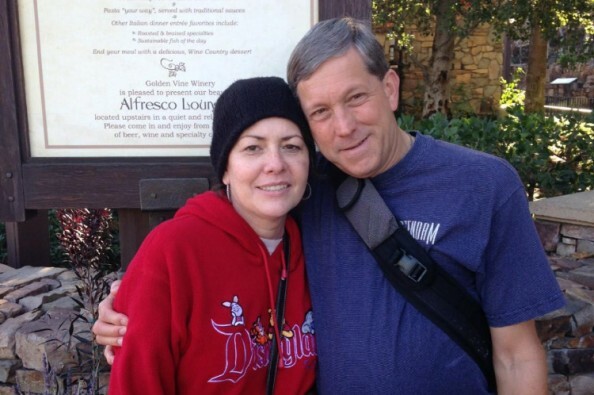 Their days are filled with doctor appointments, surgeries, chemotherapy, radiation, and hospital stays. 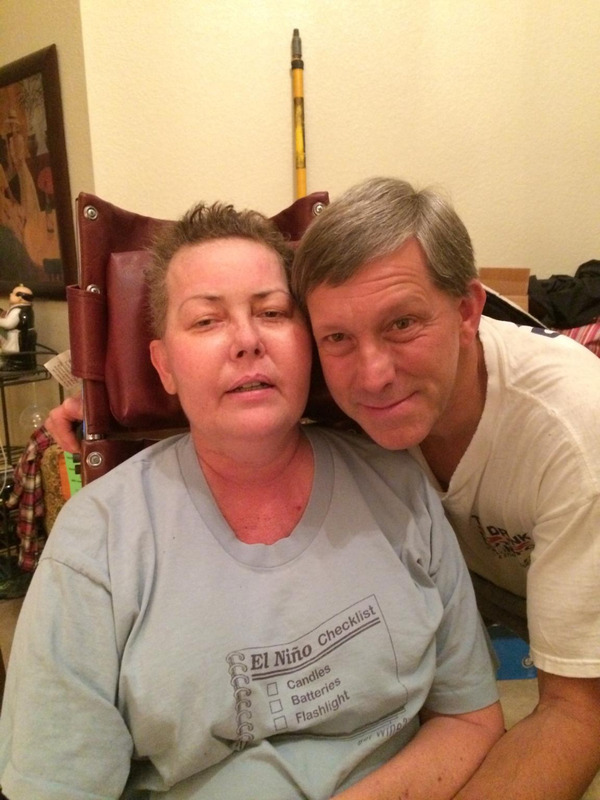 Through it all they have remained unwavering in their belief that God will heal Molly. They have drawn strength from Him and one another along the way. Molly is completely dependent upon Socks for her care. 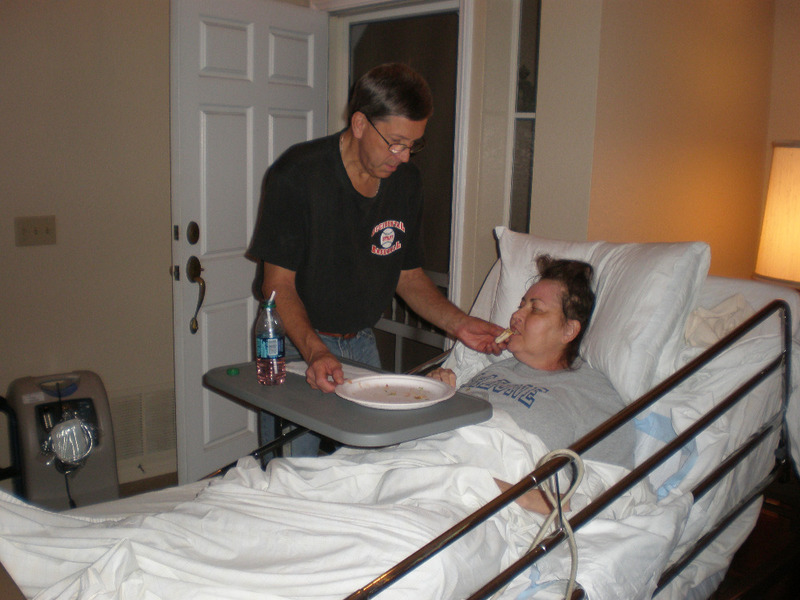 He is her caregiver, constant companion and the embodiment of Christ’s love. The very love that brought them together is the bond that has enabled them to continue along this difficult path. It has been my honor to witness their response and attitude to circumstances that would have caused many to question God and quit. Through it all, beautiful Molly remains a fighter, a fierce lover of God, a worshipper who loves to sing and has a contagious laugh. 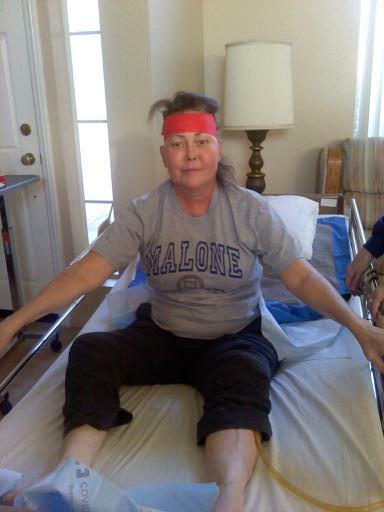 She is the strongest woman I know. If anyone can beat this, it’s her! We believe what the enemy meant for evil, God is using for good Gen 50:20. God is able to do exceedingly abundantly above all we can ask or imagine Eph 3:20. Please pray for Molly and Socks, share their story with everyone you know and help get the word out about their situation. I pray that as you read this you would also consider helping them financially, as they need help with medical bills and living expenses. Please follow the instructions to donate, and check back here for updates on Molly’s progress. We thank you for your prayers! Molly and I have been very blessed to have thousands of people praying for us ever since Molly was first diagnosed with Brain Cancer (Glioblastoma Multiforme Stage IV) after her first surgery on August 10, 2012. We truly believe in the power of prayer and it is clear that God has answered many of them. Knowing that you have been praying for us has helped us to remain positive and faithful over the past two years and we want you to know how grateful we are for your prayers and continuing spiritual support. 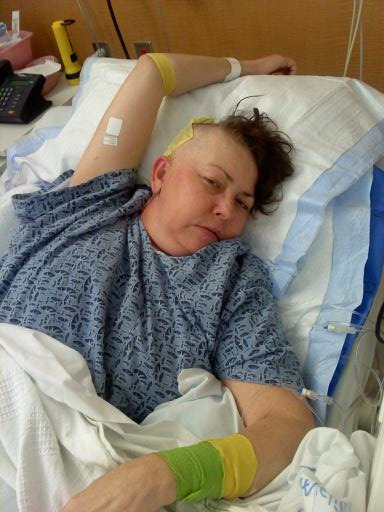 Since her initial surgery, Molly has had 3 additional craniotomies, 2 series of radiation therapy, several rounds of chemotherapy and numerous scalp infections as a result of the surgeries, radiation treatments and her compromised immune system. 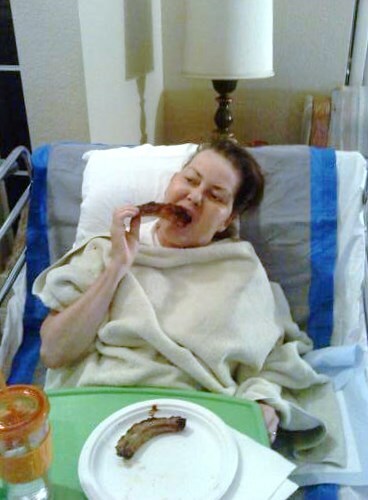 On July 15, 2014 Molly had reconstructive plastic surgery at the City of Hope to remove portions of infected skin tissue and skull and replace these with the serratus muscle from her left side and a skin graft from her left thigh. As Molly continues to recover from this major surgery, we are now just beginning to work with her doctors to plan the next steps in her cancer treatment. 1) Please continue to pray for Molly's full and complete healing from cancer and for the strength (for both of us) to continue to fight this battle until she is healed. 2) Please aggressively share this page on Facebook. We would like to reach 10,000 shares as quickly as possible. 3) Please Subscribe to the Updates on this page. 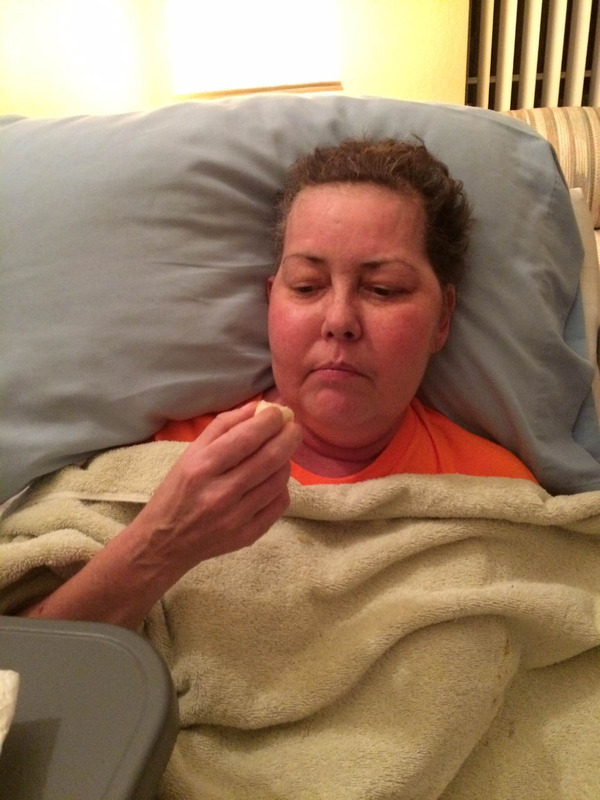 I will be writing on a regular basis and this is the best way for you to remain current on Molly's progress and learn of any additional prayer requests. 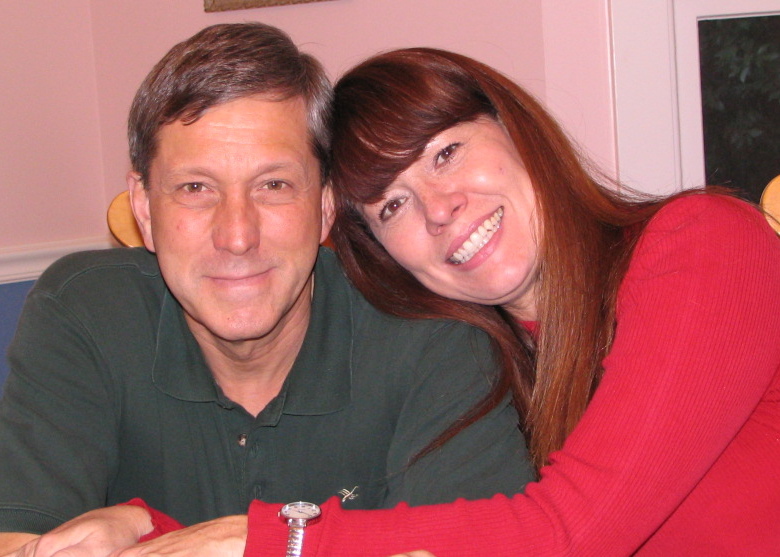 4) And finally, Molly and I want to thank you in advance for any financial donations that you feel lead to give. Because Molly suffers from significant short term memory loss and has lost most of the peripheral vision in her left eye, she requires both 24/7 care AND constant supervision. I (Socks) am her full time caregiver and am unable to work for a living. Currently, our sole source of income is Molly's Social Security Disability payments. For Those of You Who Don't Know Us (And Even For Those Who Do) We Would Like to Share "Our Story" With You In Words and Pictures. We Hope That You Enjoy Learning More About Us and Want All of You to Know Just How Much We Appreciate Your Prayers and Support. P.S. This Section is Not Yet Complete and will be updated on a regular basis. 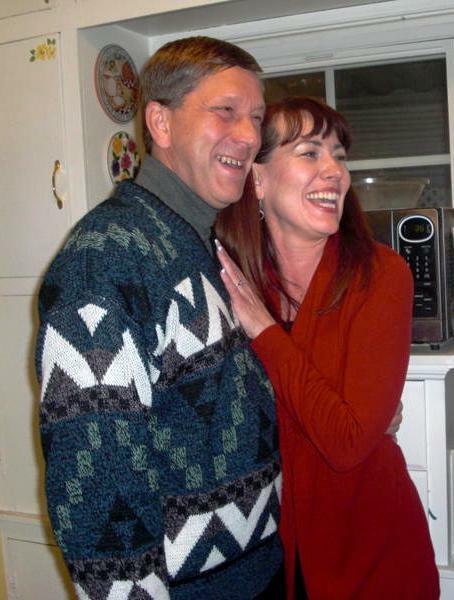 Molly and Socks met on eHarmony on May 17, 2009. 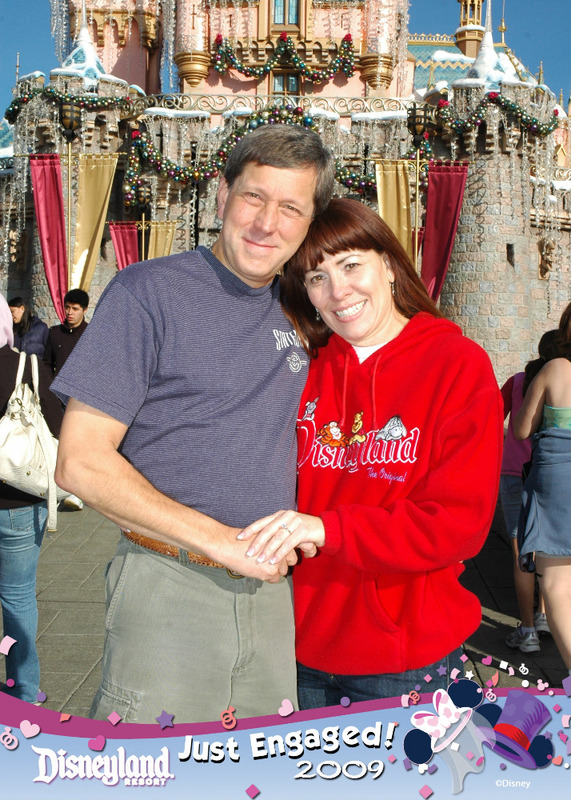 Their first "in person" meeting was at Disneyland, in front of Sleeping Beauty's Castle, on June 24, 2009. It was pretty much love at first sight. 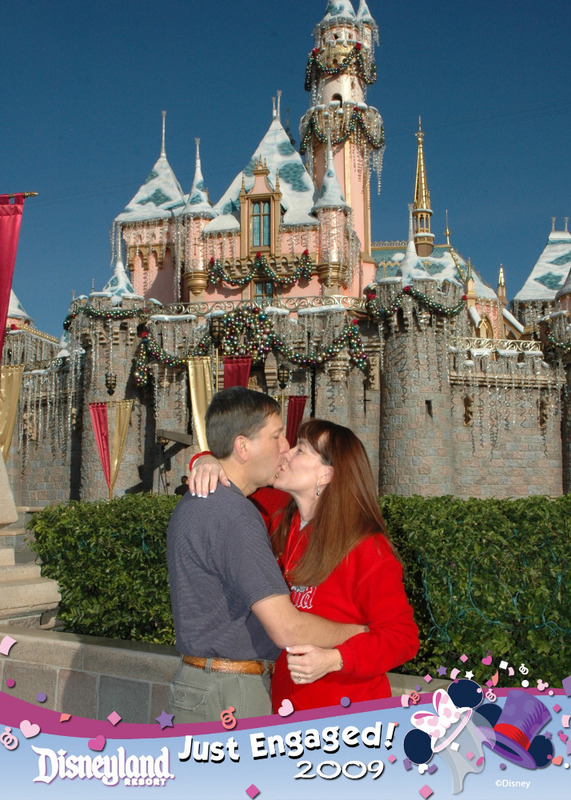 Exactly six months later, on the morning of December 24, 2009, Molly and Socks returned to Sleeping Beauty's Castle to have pictures taken to commemorate the sixth month anniversary of their first date...........at least that's what Socks told Molly. 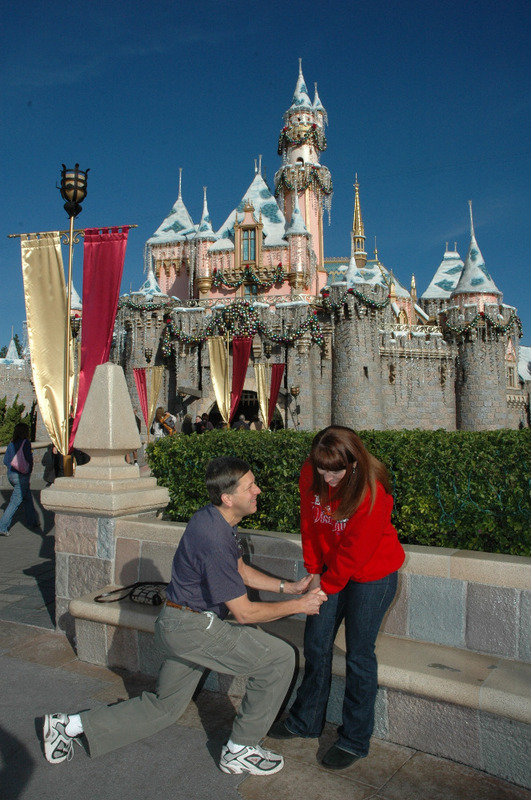 Instead, Socks proposed to Molly in the exact same spot where they first met and had a Disneyland photographer lined up in advance to record the event. 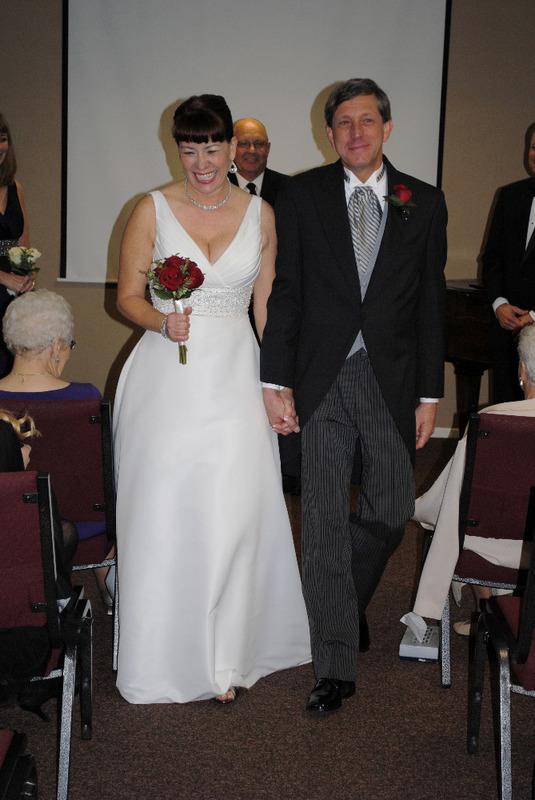 Exactly one year later, on December 24, 2010, Molly and Socks were married in Burbank, CA in a private, intimate ceremony, with only their immediate family present. 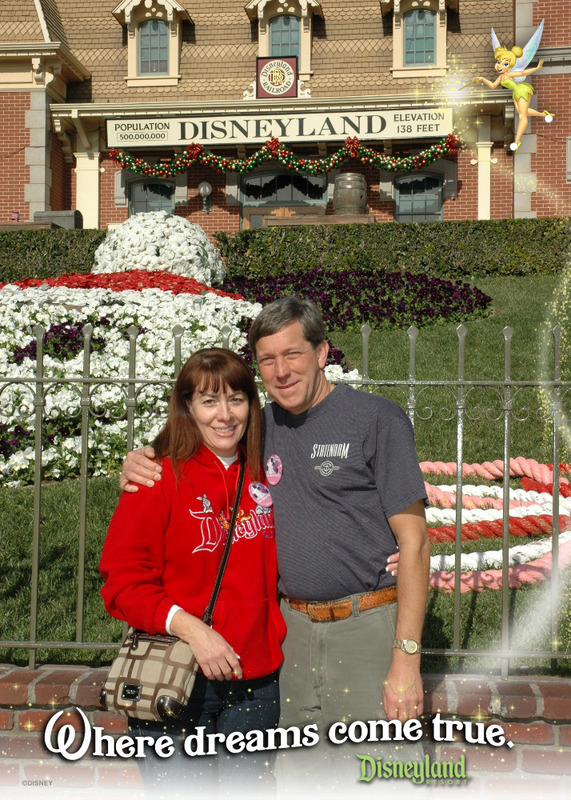 After spending the night in Burbank, Molly and I were scheduled to meet some very close friends at Disneyland on Friday morning, February 21, 2014. Unfortunately, when Molly woke up, she discovered that her entire left side was suddenly weak and she was unable to dress herself due to the loss of dexterity in her left hand. Although we enjoyed seeing our friends at Disneyland, it was a very bittersweet day. Molly was extremely tired and fatigued all day. 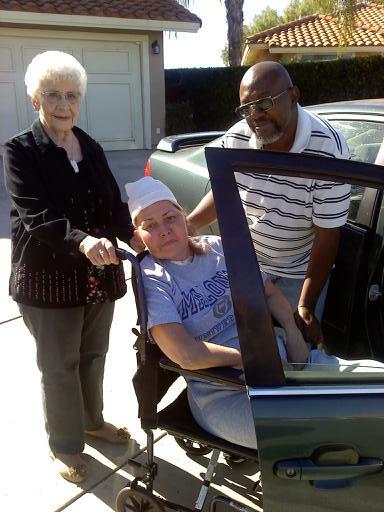 She needed help walking, buttoning her jeans in the restroom and even standing at times. 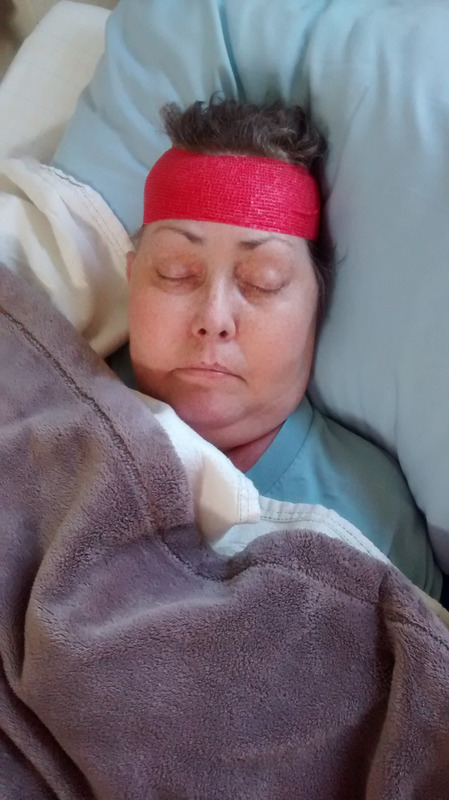 All I could think of was that her brain tumor was growing again, putting pressure on her brain and creating weakness on her left side. Molly and I left the park early and stopped to use the restrooms before the long drive back to Burbank. Molly still needed help with the buttons on her jeans but refused to use the men's restroom with me. She asked several women for help after explaining her situation but they were unwilling to assist her. Suddently, a young brunette woman appeared from Molly's left and asked if she needed some help. Molly said yes and the woman helped her to unbutton her jeans and then rebutton them after she had used the toilet. As they were walking to the sink to wash their hands, Molly thanked the young woman for her help and then asked her name. Her name was Cicely. 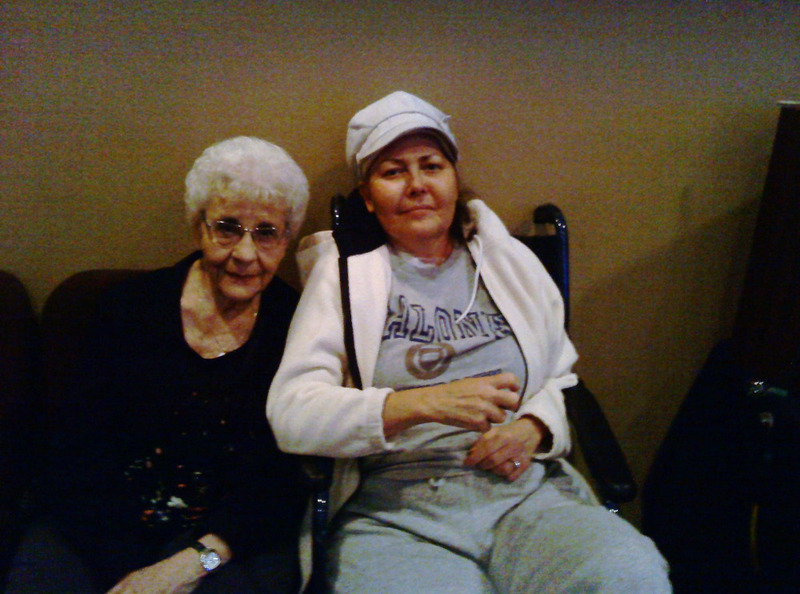 As they walked out of the restroom towards me, Molly turned to the woman and said "God Bless you Cicely. Thank you so much for your help." I thanked her as well and as I was turning to face Molly and take her hand I saw Cicely look directly at Molly and say "God isn't finished with you yet." In the next instant I grasped Molly's hand and then turned back to Cicely.....but she was gone. A few days later we received the results of the post Disneyland MRI. It showed that edema (swelling of the brain) was the cause of the sudden weakness on Molly's left side, not tumor growth. 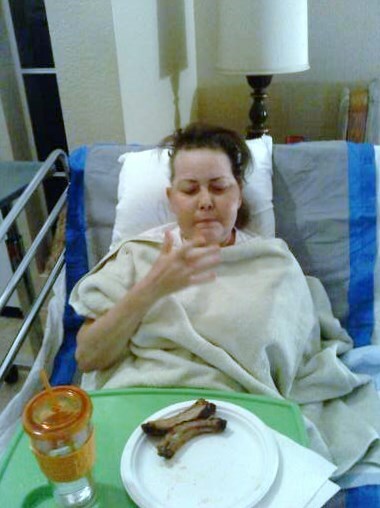 An increase in her steroid medication brought her back to normal in just a few days. I guess Cicely knew what she was talking about. Unfortunately, there is currently a large gap in the timeline of this Campaign. Much of which is currently covered in a series of Updates. Please read all of the updates before continuing. I have repeated the lastest update below to make this transition a bit easier. On the morning of Thursday, November 6th, we received some devastating news. Apparently after some additional discussion of Molly's 10/29/14 MRI results, her doctors concluded that the significant increase of edema throughout her brain was most likely the result of tumor progression and not radiation damage. 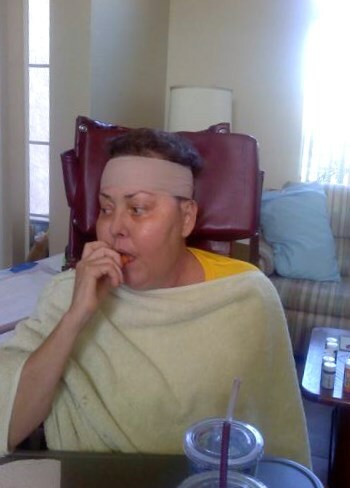 They told us that they did not believe that additional chemotherapy and / or Avastin treatments would be of any significant benefit, but would only serve to cause her additional pain and suffering. 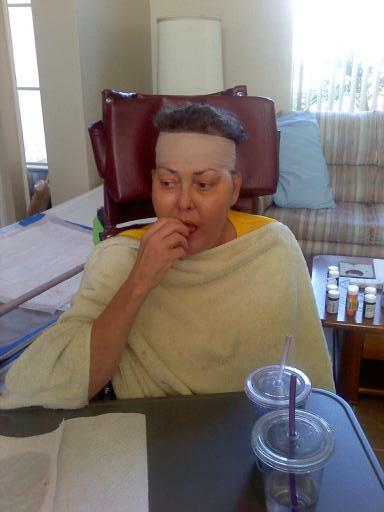 They advised us to consider Hospice and to focus on keeping Molly as comfortable as possible and to minimize her pain. This was very hard for us to accept because, at this point in time, Molly was experiencing very little pain, continued to have a healthy appetite and remained mentally alert. Despite these feelings, it was clear that Molly could no longer climb the stairs at our home up to our bedroom and needed a wheelchair for transportation outside our home. 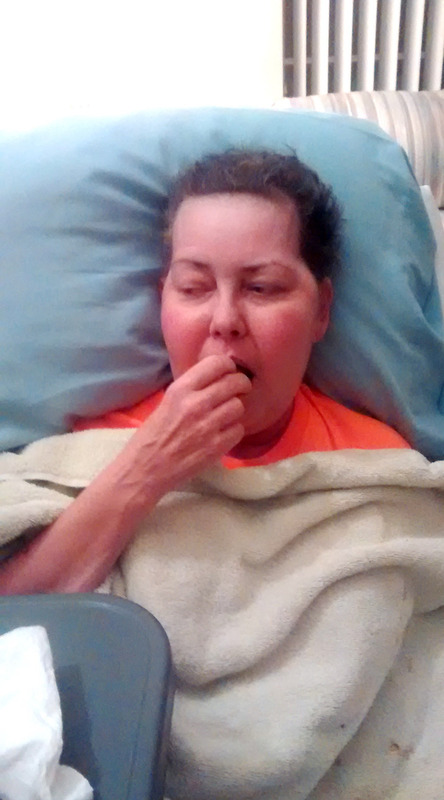 So, with a heavy heart, we agreed to contract with a Hospice Company as the next step in Molly's care so that they could set up a hospital bed for her in our living room downstairs and provide us with a couple of wheelchairs for transportation. 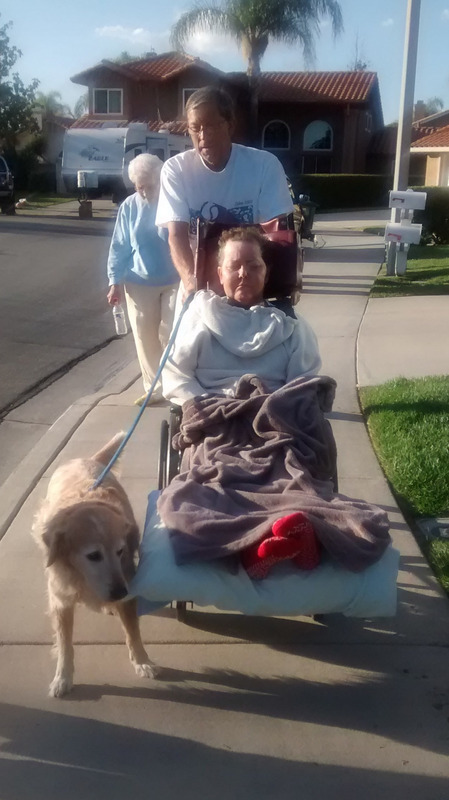 On Saturday, November 8th, Molly was transported by ambulance from her hospital room at St. Joseph's Medical Center to our home in Temecula, California. 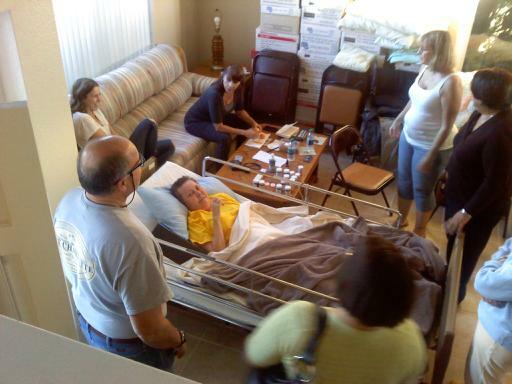 While Molly and her Mom, Maggie, were traveling by ambulance to our home in Temecula; my Dad, Stu, and I were rearranging our living room to accommodate the Hospice furniture and equipment. By the time they arrived they were hungry and ready to eat. 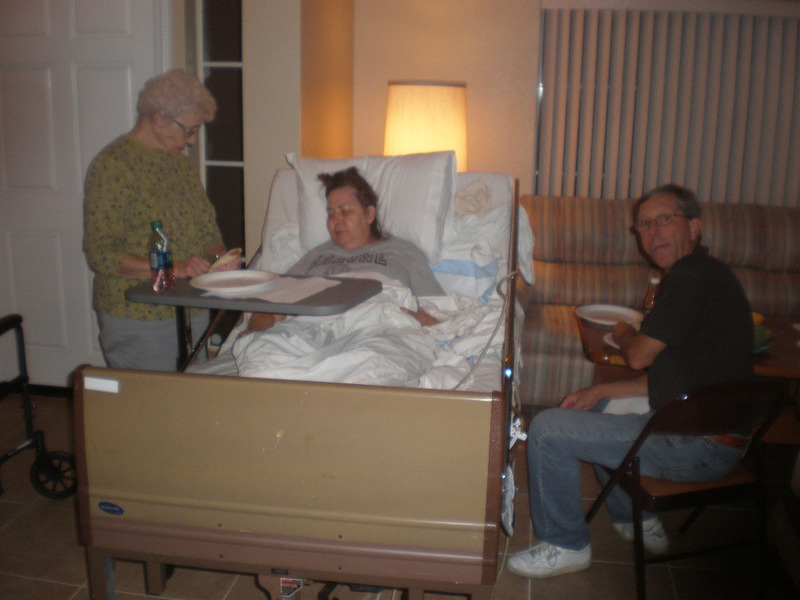 So as soon as we got Molly settled in her hospital bed we all sat down to enjoy some homemade tacos. While Molly was in the hospital this past week she kept asking when she was going to be able to go home because she did not want to miss Church on Sunday. Well, with help from our good friend, Michael Watson, Maggie and I were able to get Molly into and out of his car and a wheelchair and to Sunridge Community Church in time to enjoy the 10:30 AM Service. 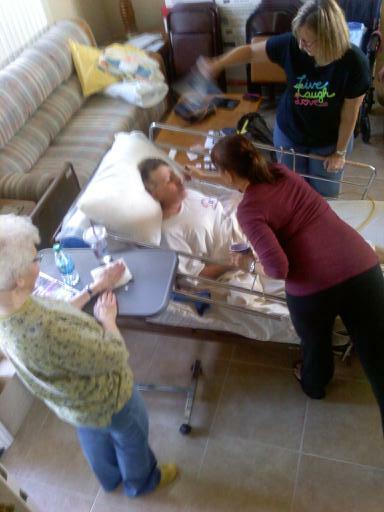 On Tuesday, Veterans Day, my brother, Jeff, came to visit. He worked with Molly and showed her some physical therapy exercises that she could do in bed so that her muscles would not atrophy. There are two meals that Molly always looks forward to me cooking for her. The first is my award winning Chardonnay Poached Salmon and the second are my World Famous (okay, maybe not the World, but at least they are famous, and appreciated, in the Henderson household) Baby Back Pork Ribs. On Saturday, November 15th two of Molly's sisters, Valerie and Lisa, arrived from Texas. Her third sister, Julie, drove in from Northern California on Monday morning. 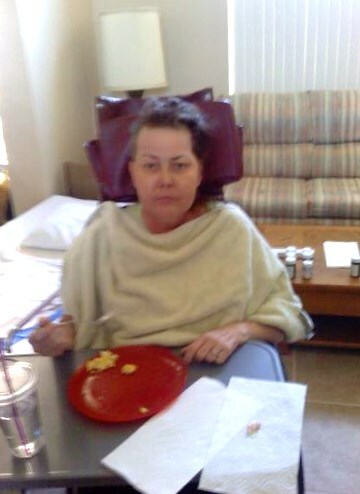 With the arrival of her sisters and a new wheelchair, we began to get Molly up and out of bed for all of her meals. 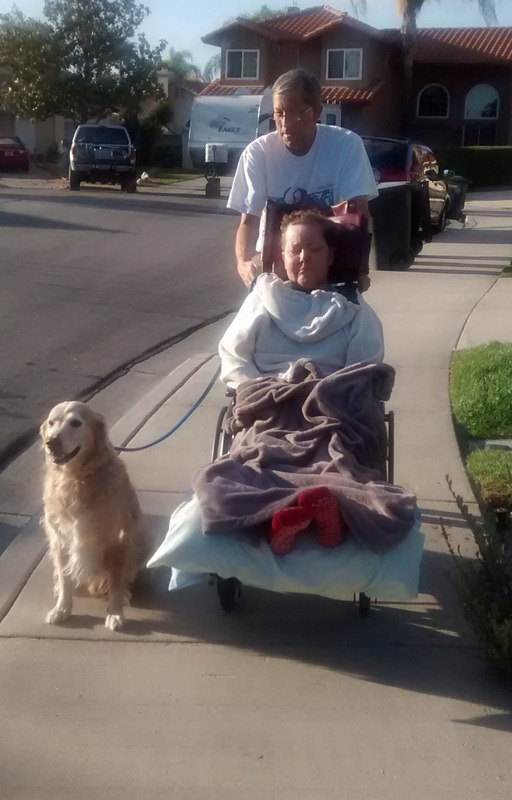 We were also able to begin taking Molly outside for a bit of fresh air and to walk her beloved Golden Retriever, Boston. 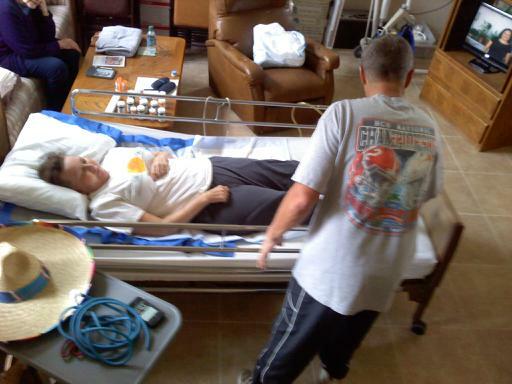 Then it was back to the house, out of the wheelchair, into the bed and time for a nap. Today, Molly received a gift of some new clothes from her sisters; including a bright orange shirt, her favorite color, to wear on Thanksgiving. Molly continues to have a good appetite and still likes her bananas and baby carrots. Today, our niece, Meagan, came to visit from Ventura. She spent the entire day with Molly and her sisters and they had a great time. She even brought Molly lunch from Chipotle Mexican Grill, one of Molly's favorite fast food restaurants. Then later in the afternoon, Molly got another surprise. Long time Burbank friends, Yvonne and Richard Colon, who had recently relocated to Florida, stopped by for an unexpected visit with their daughter, Tiffany. Needless to say, after all of that excitement, Molly was exhausted and slept very well that evening and virtually all of Wednesday to get ready for Thanksgiving! 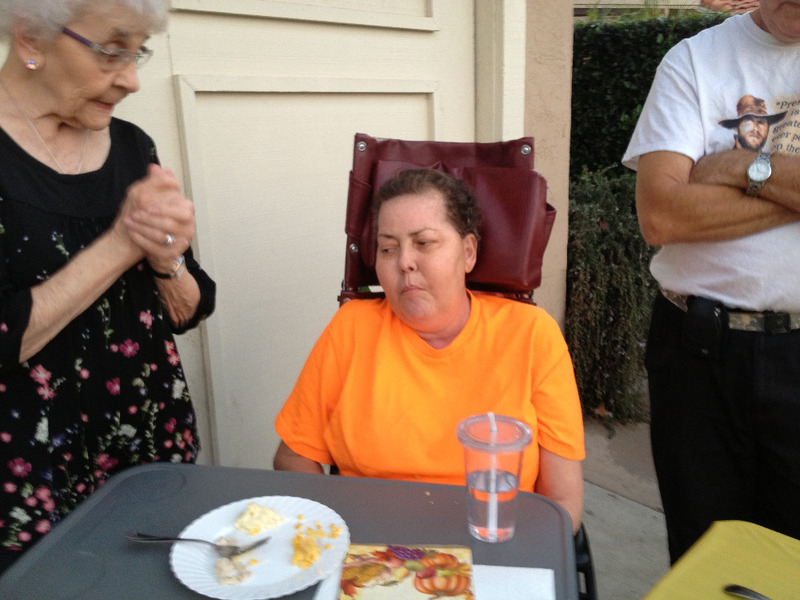 Molly’s Memorial Service will be held on Saturday, January 3, 2015 at 10:30 AM at Sunridge Community Church in Temecula. 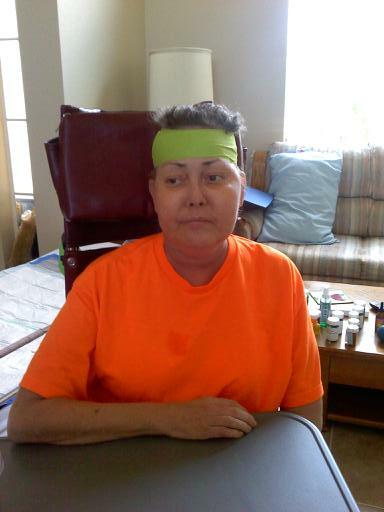 On Sunday, November 30, 2014 at 4:35 AM I watched my beautiful wife, lover and best friend, Molly Malone Henderson, take her final breath on earth, leave her cancer battered body behind and enter into the presence of God, Our Father, and his only Son, Our Lord and Savior, Jesus Christ. I am so proud of you, Molly, and the way that you finished the race; with grace, dignity and an unwavering faith in God that inspired so many people along the way. I love you very much. More than you will ever know. And I can’t wait to see you again in your brand new body….. when I too arrive in paradise. 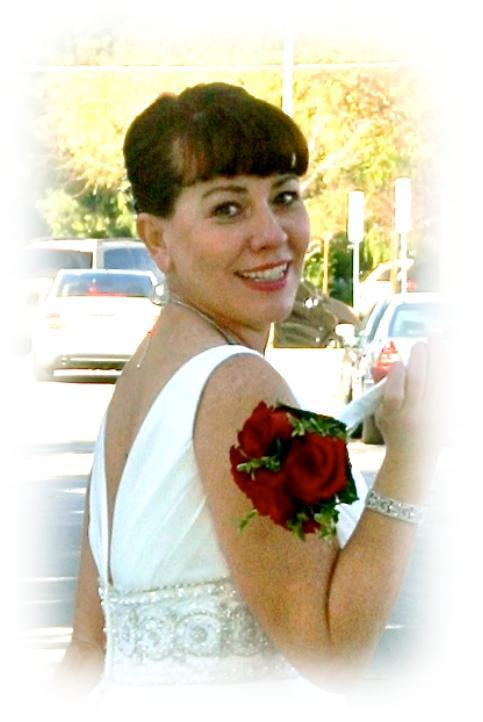 In lieu of flowers, please consider making a donation on her website to help with Medical and Funeral expenses. 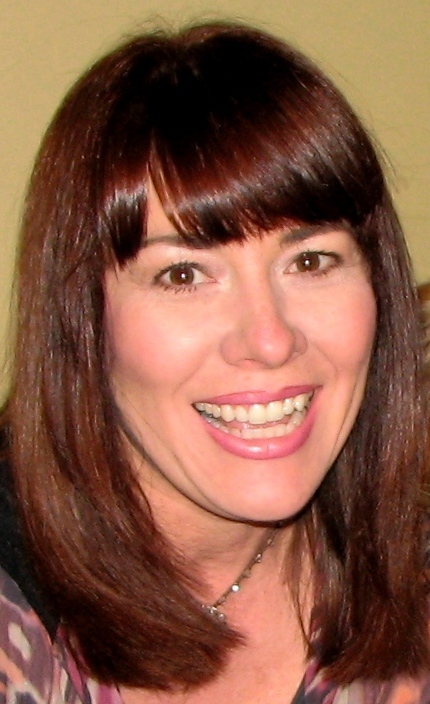 Molly’s Memorial Service will be on Saturday, January 3, 2015 at 10:30 AM at Sunridge Community Church in Temecula. 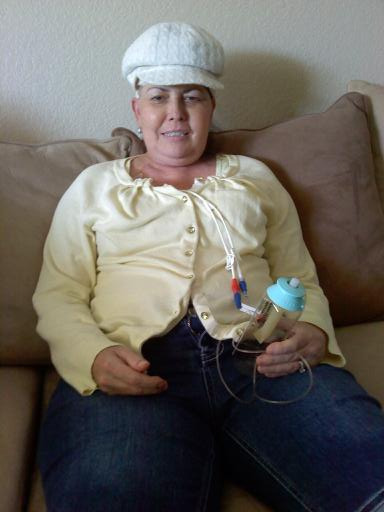 On Sunday, November 30, 2014 at 4:35 AM I watched my beautiful wife, lover and best friend , Molly Malone Henderson, take her final breath on earth, leave her cancer battered body behind and enter into the presence of God, Our Father, and his only Son, Our Lord and Savior, Jesus Christ. In lieu of flowers, Molly’s family is asking that you consider making a donation on this website to help with Medical and Funeral expenses. Please note that I have discovered a limitation on the Update Feature of the Go Fund Me website. You can only post 3 pictures per update. I have more than 20 pictures from Molly’s Hospice Journey that I would like to share. Rather than quickly produce 7 or 8 short updates and flood your Inbox with emails from this site, I decided to update the Campaign itself. 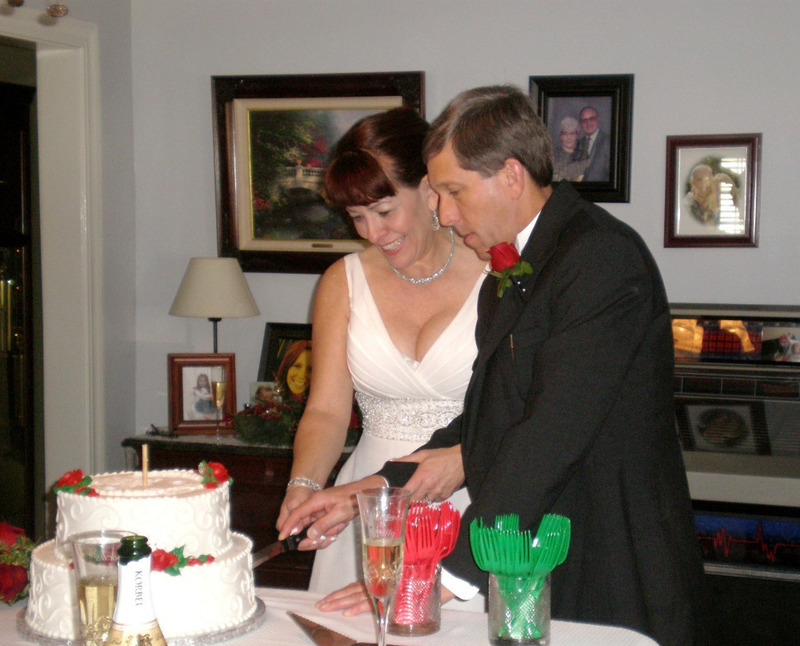 Ever since we were married in December, 2010, Molly has wanted to host Thanksgiving Dinner at our home. Well, this year she finally got her wish. 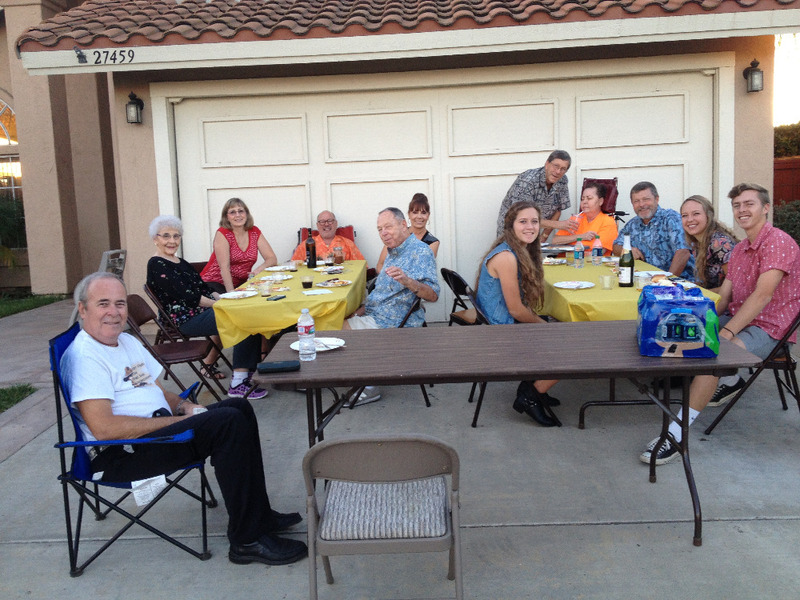 Since Molly’s mom and two of her sisters were already staying with us, we decided to order a pre-cooked Thanksgiving Dinner from Vons and invite my Dad, brother, Jeff, and his family and Molly’s two brothers to join us. Then my Dad decided to rent a Timeshare for the Thanksgiving week at the Welk Resort in Escondido, which is only about 20 minutes from our home in Temecula, so my family would not have to drive 2 hours in traffic on Thanksgiving Day. Once that was done, my brother’s family decided to cook a turkey and some of the side dishes at the Welk Resort and bring it with them to our house instead of picking up a pre-cooked dinner from Vons. 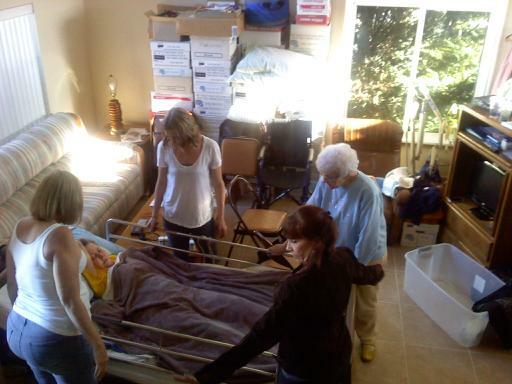 It all came together when Molly’s mom and sisters announced that they would cook the remaining side dishes here at home and help me to set up tables and chairs in our driveway on Thursday morning. You can see the result in the pictures below. Molly, dressed in the brightest orange shirt that I have ever seen, was the official hostess and oversaw the entire operation from her wheelchair vantage point. The homemade Thanksgiving Dinner was delicious and the weather was perfect. 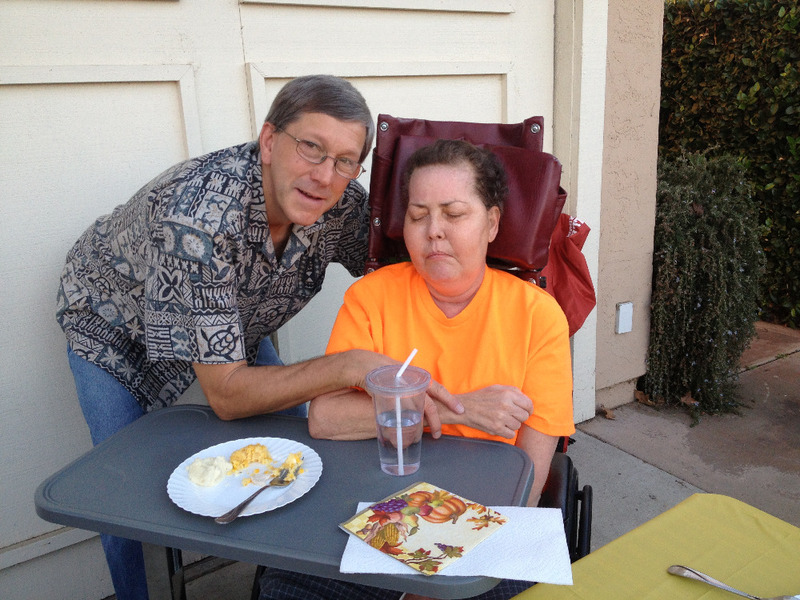 Everyone had a great time and we all enjoyed being with Molly and helping her to realize her dream of hosting Thanksgiving Dinner at our home. By the time dinner and dessert were finished, Molly was exhausted and returned to bed where she slept well that night and most of the next couple of days. 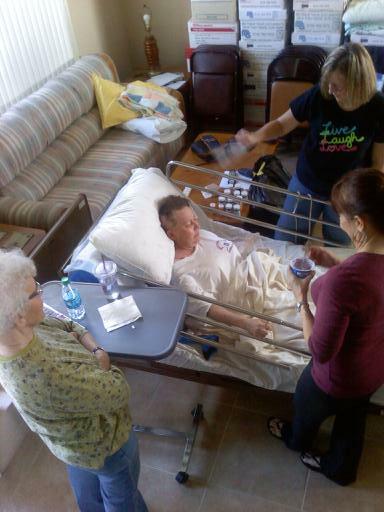 Thank you again for all of your continued prayers and support. 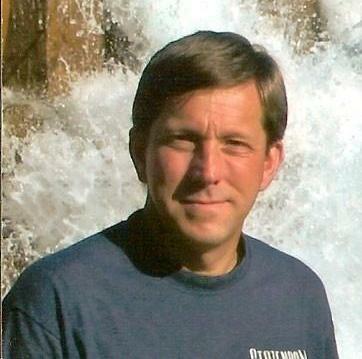 My thoughts and deepest sympathy's are extended at this time to Socks and Molly's family. Socks- I can only imagine how great your sense of loss must be. I am so glad that God gave you this precious time together. You both have been am inspiration to many. I pray that you will feel all the love that is going out to you. I pray that God's love an comfort with give you the strength that you need.